Steady white steam emission to heights of 30-250 m from vents near the summit continued through 1992, almost unchanged from previous years. The Global Volcanism Program has no Weekly Reports available for Niigata-Yakeyama. Mt. Yakeyama, which began erupting on 28 July, continues to belch smoke, spreading ashes over a wide area of Niigata Prefecture. The . . . mountain erupted at 0250 JST on 28 July for the first time in 25 years. Between 0.5 and 1 cm of ashes fell on cities and towns in the prefecture, including Joetsu and Arai. It was feared that mulberry trees, leaf tobacco, and vegetables had been seriously damaged by the ashes, and a helicopter was flown over the area to view the eruption and make a survey of the agricultural damage. Information Contacts: Seismological Division, Japan Meteorological Agency (JMA). Mt. Yakeyama . . . continues to emit white smoke (figure 1). Except for minor activity, this is the first eruption in 25 years. The eruptions have been occurring in or near the summit crater of the lava dome, and most of the smoke is issuing from a 200-300-m-long fissure on the western flank of the lava dome. A survey team determined that a mudflow began at the upper reaches of the Hayakawa stream, and trees near the fissure crater were washed away. Three mountain-climbing students from the Chiba University, who were camped near the fissure crater, were killed by ejected fragments or poisonous gases. Figure 1. Photograph showing white emissions from the flank of the central lava dome at Niigata-Yake-yama on 3 August 1974, three days after the first explosion. Courtesy of JMA. On the morning of 15 April, a local resident noticed gray-tinted snow on the N flank and a plume near the summit area. On 18 April, a joint observation team from the firehouse, the district forestry office, and the city office of [Itoigawa] (20 km NE of the volcano), visited the summit area and found that ash had fallen on the snow over the N flank. Analysis of an ash sample at Niigata University showed that the ash was not freshly magmatic, but was composed of fragmented old rock that contained mainly plagioclase, amphibole, and pyroxene phenocrysts. No seismic activity was recorded, but no JMA seismograph is installed within 30 km of the volcano. The volcano is a 400-m-high lava dome that rests on 2,000-m-high mountains underlain by sedimentary rock. During its last eruption, a phreatic explosion from fissures in the N and W flanks [near the summit] on 28 July 1974, three climbers were killed by ejecta, ash fell as far as 100 km to the NE damaging about 220 km2 of farmland, and two mudflows descended the N flank. A small ash ejection is presumed to have occurred between late April and 1 May when brown snow was observed on the flank. At 1000 on 2 May fume clouds were rising 30-50 m from the NE part of the summit. Plume height reached 100 m on 4 May, and on 19 May 100-150-m-high clouds issued from three sites on the NE flank and one site on the SE flank. Similar activity was seen on 27 May, when seven sites were active; two emitted grayish fume and had yellow sublimates. On 8 June fuming continued from one site at the summit and two sites on the upper NE flank, but at lesser volumes than in May. By 18 June the fume reached only 20-30 m. When observed on 19, 23, and 29 July, clouds rose 70-100 m from 2-3 sites on the upper NE flank and in the summit region. Eight fuming sites were visible on 7 August from the foot of the mountain and small amounts of white fume were rising 50-70 m. Observations on 7 and 11 August showed discoloration in the area from the summit to the upper E flank. Observations from the N foot of the volcano (8 km from the crater) on 7 September showed that the fuming from the upper NE flank was continuing. Summit fuming had visibly increased since 7 August observations, but fuming from the upper NE flank had decreased in volume. On 14 and 24 September, white vapors were seen rising from the E flank. 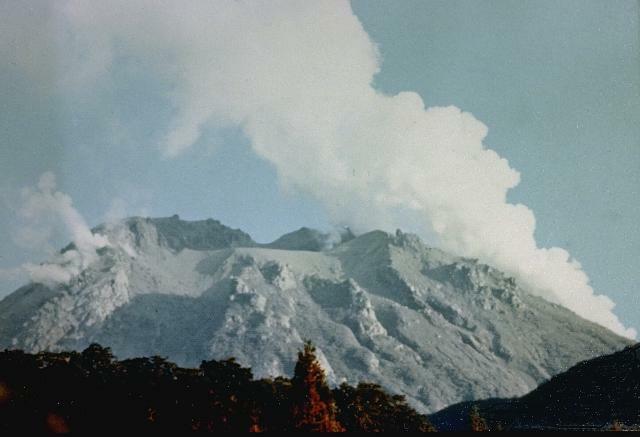 A white steam plume was rising from the volcano's upper E flank during observations by the staff of Takada Weather Station (from sites 10-20 km away) 1 May 1987-September 1988. Emissions gradually declined, and after a 9 November 1988 visit, no plume was observed. Moderate steam emission was seen again on 30 March 1989, with a white vapor plume rising 100-150 m from 2 areas on the upper E flank. Steam from the upper NE flank rose about 30-50 m on 15 April. Four days later, steam with a small amount of ash was emitted to about 100-150 m above the upper E flank, the first sighting of a gray plume since May 1987. Observations from Sasagamine (about 8 km SE) on 26 April revealed gray plumes rising 250-300 m from many sites on the upper E flank. A 30 April steam plume, about 300-400 m high and blown 600 m by the wind (figure 2), was the highest since May 1987. Access to the volcano has been closed to tourists. Figure 2. Height of steam plumes at Niigata-Yake-yama, 1987-91. Courtesy of JMA. Steaming from vents near the summit has increased slightly since October. A seismometer installed near the volcano on 20 December recorded only 1 weak earthquake by 16 January. Steam emission has continued since late April 1987 (figure 1), when a small ash ejection occurred. Larger plumes in April 1989 also included ash. Niigata-Yakeyama, one of several Japanese volcanoes named Yakeyama ("Burning Mountain"), is a very young andesitic-to-dacitic lava dome in Niigata prefecture in central Honshu, near the Japan Sea. The small volcano rises to 2400 m and was constructed on a base of Tertiary mountains 2000 m high beginning about 3100 years ago. Three major magmatic eruptions took place in historical time, producing pyroclastic flows and surges and lava flows that traveled mainly down the Hayakawa river valley to the north and NW. The first of these eruptions took place about 1000 years ago (in 887 and possibly 989 CE) and produced the Hayakawa pyroclastic flow, which traveled about 20 km to reach the Japan Sea, and the massive Mae-yama lava flow, which traveled about 6.5 km down the Hayakawa river valley. The summit lava dome was emplaced during the 1361 eruption, and the last magmatic eruption took place in 1773 CE. Eruptive activity since 1773 has consisted of relatively minor phreatic explosions from several radial fissures and explosion craters that cut the summit and flanks of the dome. Hayatsu K, 1994. The activity and age of Niigata-Yakeyama volcano, central Japan. J Geog, 103: 149-165 (in Japanese). Hayatsu K, 1987. Pyroclastic flows erupted in medieval time at Niigata-Yakeyama volcano, Japan. Bull Volc Soc Japan (Kazan), 32: 77-80 (in Japanese). Itoh H, Hayatsu K, Suzuki K, 2000. Small scale eruptions of Niigata-Yakeyama volcano 1997-1998. Bull Volc Soc Japan (Kazan), 45: 181-186 (in Japanese). 0989 Unknown Confirmed Historical Observations Koyaike Ash; tephra layer KG-c? There is no Deformation History data available for Niigata-Yakeyama. There is no Emissions History data available for Niigata-Yakeyama. Steam pours from vents on Niigata-Yake-yama on August 3, 1974, shortly after a brief explosive eruption on July 28. 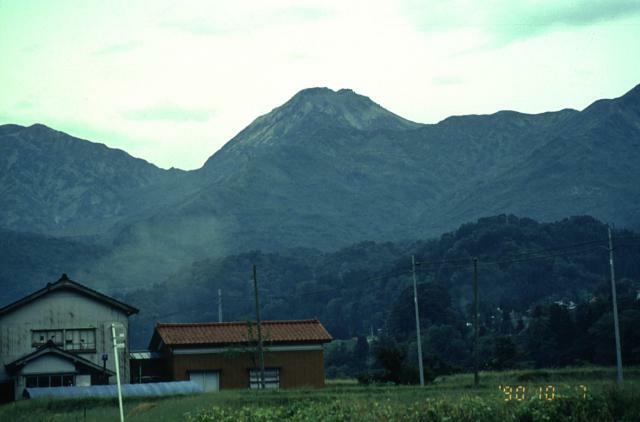 The eruption killed three climbers and produced ashfall that caused much damage to croplands. Niigata-Yake-yama is a young andesitic lava dome near the Japan Sea, one of several Japanese volcanoes named Yake-yama ("Burning Mountain"). Several explosion craters and fissures, formed during historical eruptions that date back to the 9th century, cut the summit and flanks of the dome. Niigata-Yake-yama, the flat-topped peak in the center of the photo, is one of several Japanese volcanoes named Yake-yama ("Burning Mountain"). The andesitic lava dome, seen here from the north, is located in Niigata Prefecture, near the Japan Sea. Yake-yama is a very young volcano that was constructed beginning only 3000-3500 years ago. Several explosion craters and fissures, which were formed during historical eruptions that date back to the 9th century, cut the summit and flanks of the dome. There are no samples for Niigata-Yakeyama in the Smithsonian's NMNH Department of Mineral Sciences Rock and Ore collection. Large Eruptions of Niigata-Yakeyama Information about large Quaternary eruptions (VEI >= 4) is cataloged in the Large Magnitude Explosive Volcanic Eruptions (LaMEVE) database of the Volcano Global Risk Identification and Analysis Project (VOGRIPA).